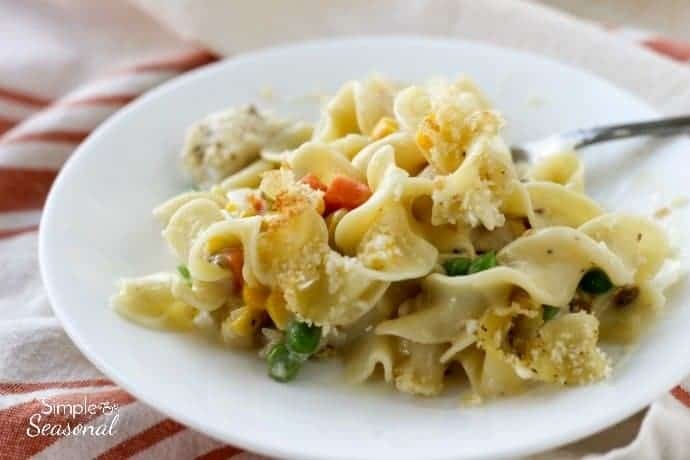 Perfect for busy fall evenings, Creamy Chicken Noodle Casserole is packed with vegetables and comes together in minutes. It’s the perfect comfort food! It’s finally cooling down and acting like fall around here, so I’ve been scouring my Pinterest boards for yummy comfort food. 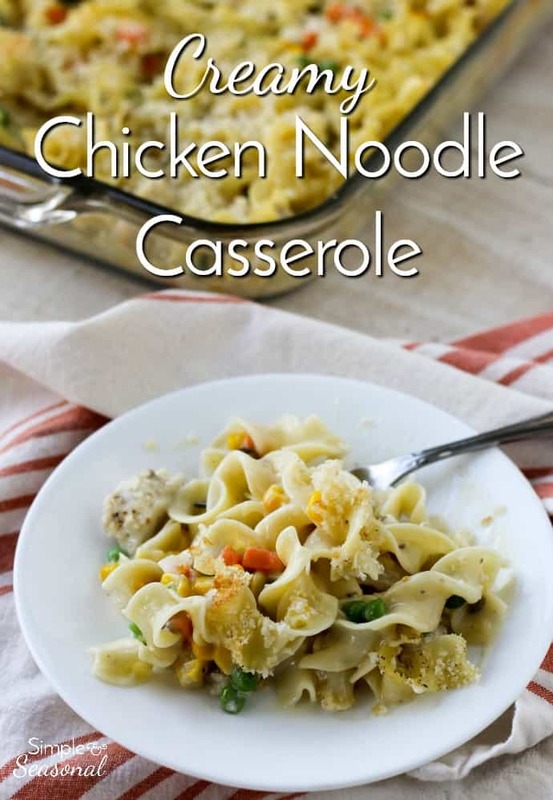 One of the most common kinds of comfort food is casserole. 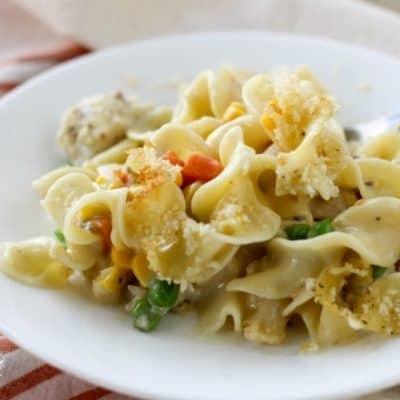 It’s easy, filling and you can combine a whole variety of flavors in one dish! 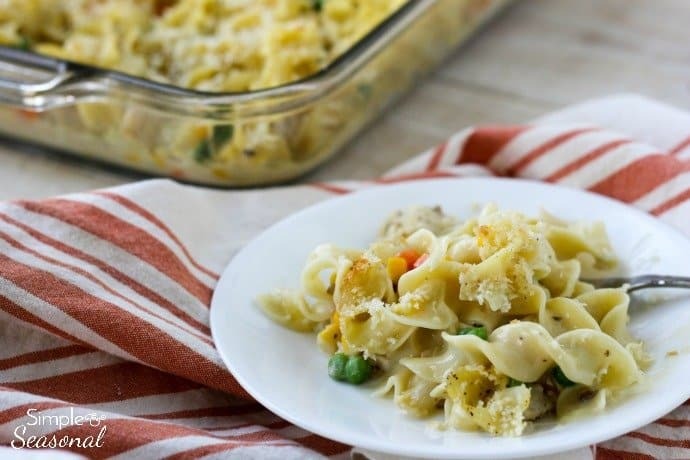 This Creamy Chicken Noodle Casserole is quick to put together so it’s perfect for busy fall evenings. This post was sponsored by No Yolks as part of an Influencer Activation for Influence Central and all opinions expressed in my post are my own. Check out No Yolks on Pinterest for more great recipe ideas! This recipe for Creamy Chicken Noodle Casserole actually came out of an old cookbook I picked up at a garage sale. I added a few tweaks of my own, like the crunchy topping. It’s nostalgic comfort food perfect for the whole family! 2 cups seasoned, cooked chicken I used diced chicken breast, but shredded rotisserie chicken is great, too! 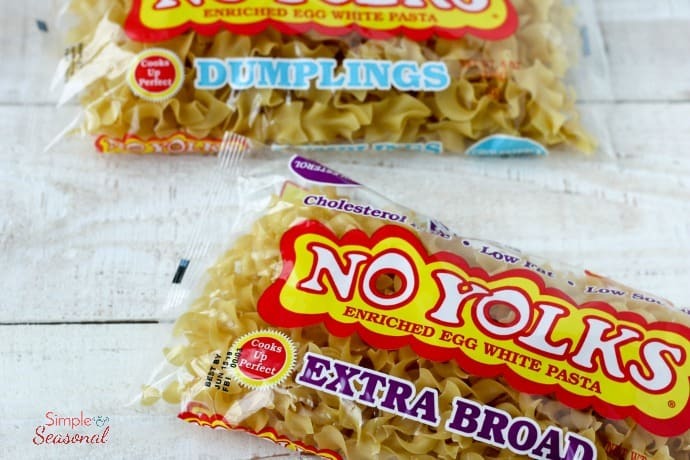 Boil the No Yolks noodles according to package directions. Drain and set aside. In a large bowl, combine all the other ingredients except the panko crumbs and butter. Add the cooked noodles to the mixture and gently stir. Place in the 9x13 pan and then sprinkle the crumbs over the top. Pour the melted butter over the top of the crumbs. Bake uncovered for 30 minutes or until warmed through and bubbly. Let sit for 5 minutes before serving. Recipe adapted from the Home in the Heartland cookbook. Similar recipe found on Life in the Lofthouse. No Yolks is giving away five $100 gift cards from October 3-November 15, 2017. You can enter below! I-C will randomly select 5 winners from all program entries and will facilitate fulfillment of the winning prizes. In the meantime, grab a coupon for .50 off here! Looking for more classic comfort food? 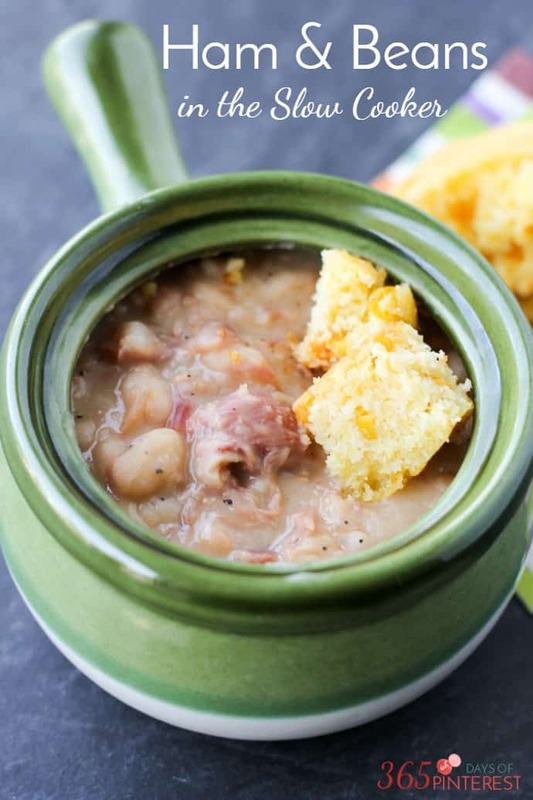 Try Ham and Beans!